Eric Stockinger reports on the relaunch of "Lyric" after a complete rebuild to original configuration. First races have been sailed on local waters (Mainsail showing 72 of "Cloud IX"?) and the boat will serve as flagship boat for the yard. Boat & Crew are looking forward to join other 5.5's, racing on the East Coast. 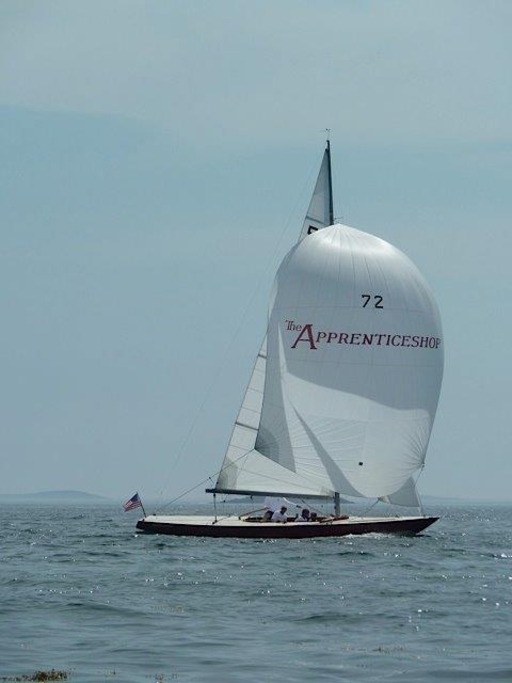 For sale at Atlantic Challenge, Maine: (1965) LOA: 31' 4" Full length mahogany planks on steambent ash frames, bronze fastened throughout. The spars are of aluminum. There are 3 mainsails, 5 jibs and 2 spinnakers, most in very good condition, as are the hull and rigging.